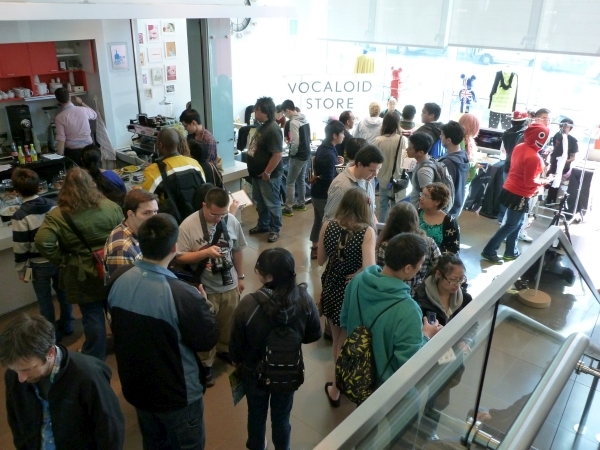 On March 3rd 2013, NEW PEOPLE and Vocalekt Visions hosted a special VOCALOID3 Megpoid English launch event in Japantown of San Francisco, California. This was a free event consisting of software demonstration sessions, a merchandise booth and live concerts that ran from noon to 6pm. NEW PEOPLE was created by the founder of VIZ Media, Seiji Horibuchi, and its building features Japanese fashion stores, a cinema, art galleries, and more. 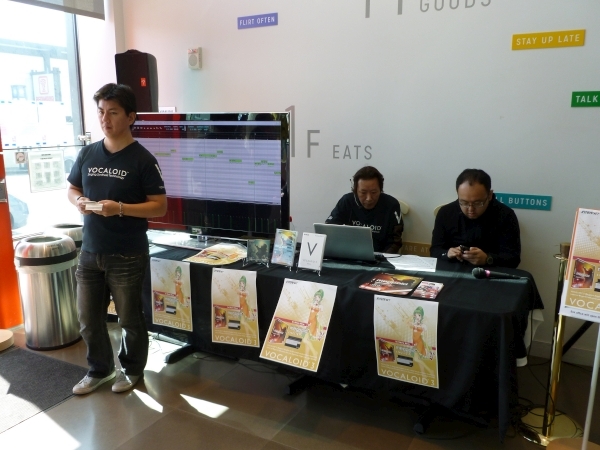 The V3 Megpoid English Launch Event took place in the cafe lobby and cinema area. 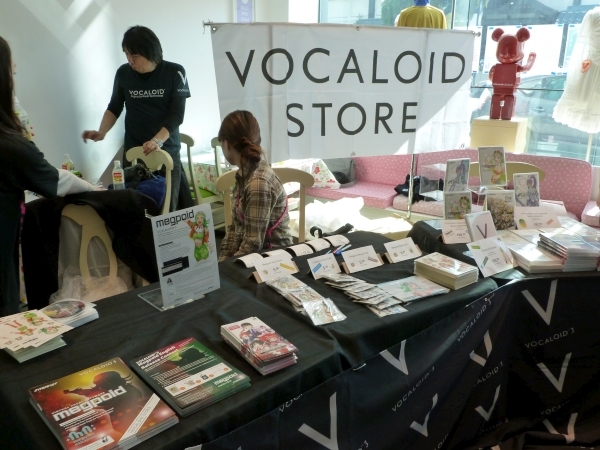 It featured a demonstration, merchandise sales, and a free show by Vocalekt Visions. For more information about V3 GUMI English, Internet Co. Ltd. has a special page up on their website. The demonstration was led by Noboru Murakami of INTERNET Co., Ltd. and another person who I assumed was an employee. There was a widescreen TV hooked up to a computer showing the program. Murakami explained the general features of VOCALOID3 and how to use them. He was working with a line from one of their demo songs, Miraculous Encounter, and demonstrated things such as inputing words and altering the syllables and notes. He also explained each of the parameters and gave examples of what changing each of them did, like how you can alter the huskiness of GUMI’s voice to make her sound more childlike or more manly. The presentation pretty much had the same content as the Megpoid English introductory video on INTERNET’s YouTube channel. Setting up for the first demonstation. Murakami also talked about the V3 Megpoid English contest hosted by Internet Co. Ltd. 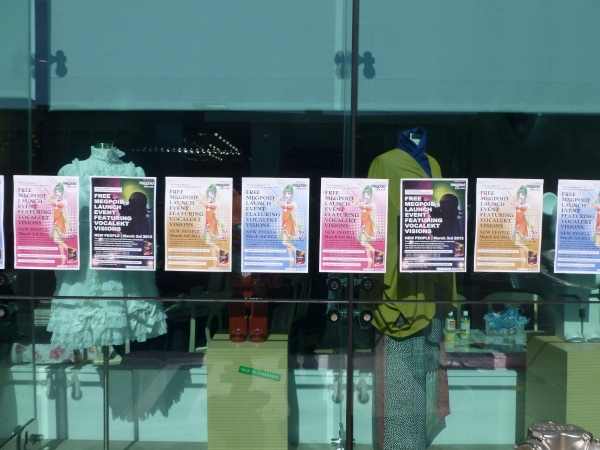 Upon entering the NEW PEOPLE building attendees were given a trial DVD of Megpoid English and a flyer explaining the contest; it consists of submitting a 16 measure song using the trial software and uploading it on niconico with the tag “GUMIENGCONTEST”. Prizes are to be given out by lottery. There were several tables set up in the cafe lobby with various goods — stickers, calenders, clear files, keychains, T-shirts, and CDs. 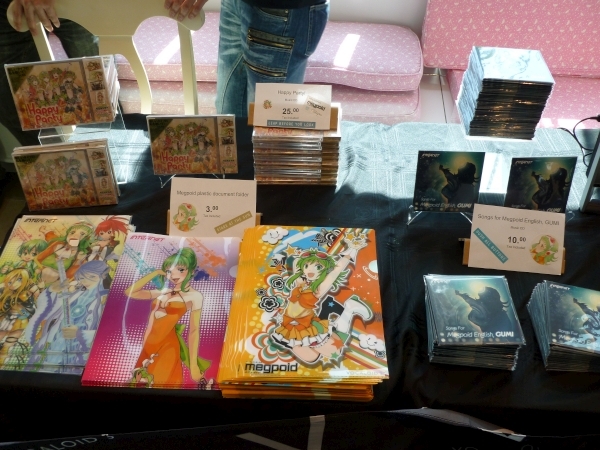 Most of these goods are sold online or were sold at other Vocaloid events. One of the CDs was a compilation album featuring the demo English songs called “Songs for Megpoid English, GUMI” that may be an event exclusive item. 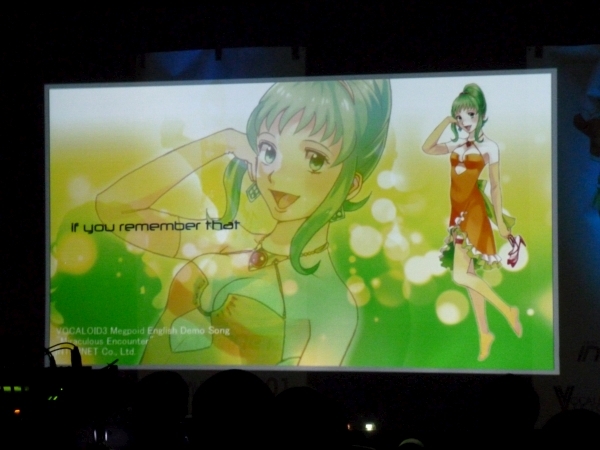 There was also a computer screen set up playing promotional videos from INTERNET’s GUMI playlist on YouTube. 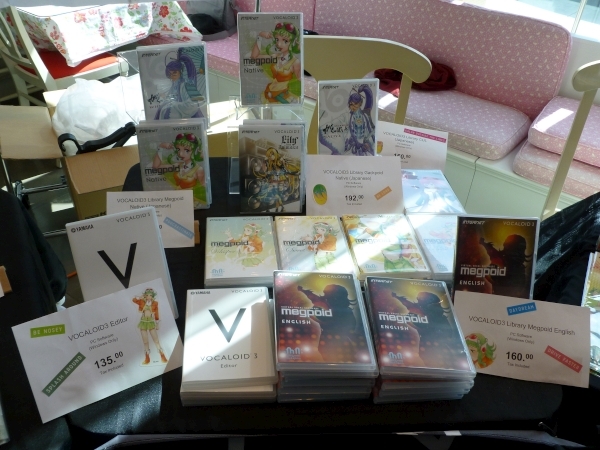 There were even various VOCALOID programs for sale, such as V3 GUMI, V3 Gakupo, Lily, CUL, and VOCALOID3 Editor. At the end of the Megpoid English demonstration, free tickets were handed out to the audience. Seating was assigned and the live show took place in the cinema at the bottom floor of NEW PEOPLE. 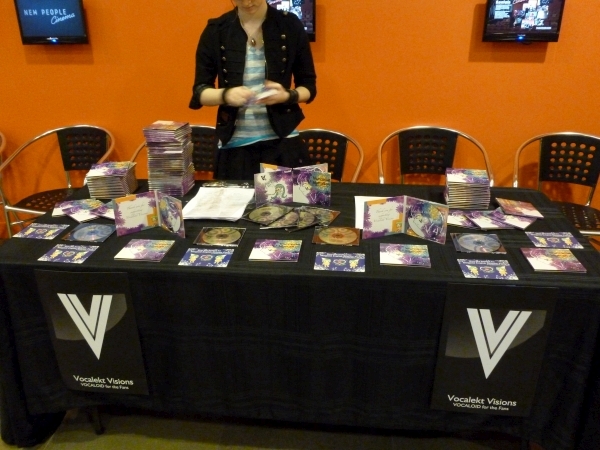 In the waiting area, Vocalekt Visions had a sales booth with many CDs. The first show “sold out” of tickets, and the theater was nicely packed. As we entered the cinema, we were each given a glow stick and a program. 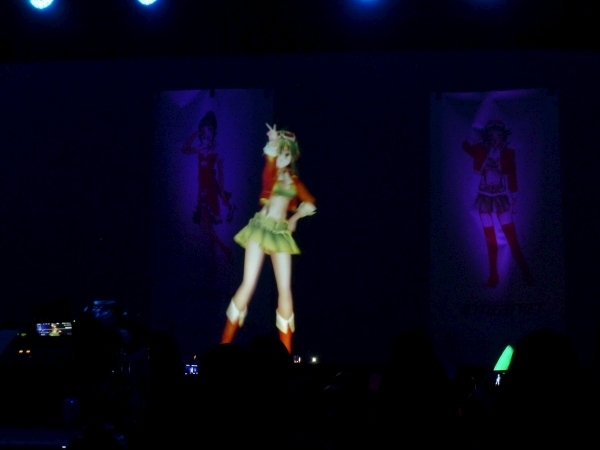 The first part of the show featured performances by the dance group World Vocaloid Dance 01, and the second part featured MMD dances projected on an fly screen, giving a 3D-like experience. Song titles contain links to the original upload of the song. 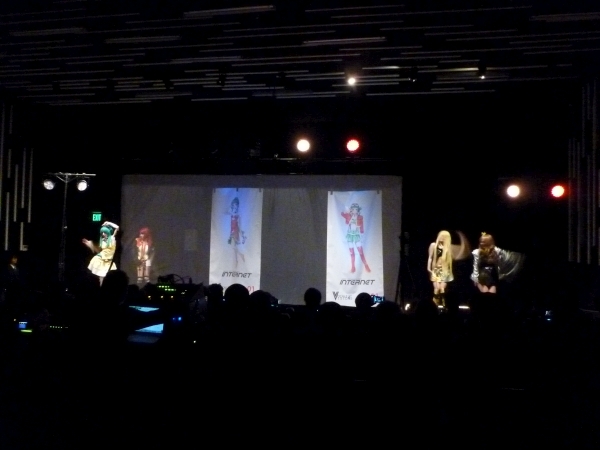 The dancers of World Vocaloid Dance 01 performed wearing cosplay of various VOCALOID characters. There was a GUMI, a CUL, a Lily, a Kiyoteru, and a Galaco. Different groupings of members performed the dances, and it seemed most of the choreography was based on popular dances from MMD and Odottemita of the songs. While non-flash photography was allowed during the event, I wasn’t able to take clear pictures. The set-up of the fly screen for the animation part of the show was very impressive. The screen was very flat and had no ripples. The images and animations were smooth and clear, thanks to how dark the room was and the flatness of the screen. This was probably the most impressive use of a fly screen I’ve seen so far. It really gave the illusion of a 3D image floating in the middle of the stage. With exception of the first song, all the songs in the Vocalekt Visions concert featured animations using 3D models projected onto the screen; most of the animations featured dances using the ever-so-popular Mamama-shiki GUMI MMD model. All the songs were sung by GUMI, with the exception of a Yuzuki Yukari song, and various strobe lights flashed in sync with the music and animations. The live show closed with some thanks and messages from Tempo-P and Noboru Murakami. The demonstrations and merchandise sales continued for several more hours and there was another live show in the evening. Overall, this event was a pleasant one, and I hope more events like this happen in the future!